Have you ever started something and not finished? Ever PLANNED something (to death) and then not begun?You might be caught up in perfectionism. What? Me? Perfectionism? It couldn’t be! Next you might say to me, you should see my house, closet, car, bookshelf, purse…on and on…it’s so messy. How can I be a perfectionist? Are you still scratching your head wondering why not starting or not completing a project can be due to perfectionism? Well, here’s the kicker. IF you don’t finish (or start), you can’t ever be judged (most likely by you) as imperfect. You can spend all sorts of time beating yourself up about the project not being done, but that’s a different ballgame! Bottom line is WHY you’re not starting or finishing is most likely – perfectionism. Good news! Once this perfectionist tendency is uncovered, THEN something can be done about it! Namely, practicing being uncomfortable with things not being perfect! Did you see that? Read it again! By having the second portion of each of the definitions “as good as it is possible to be” and “as close to such a condition as possible” it gives us space – wiggle room to do our best and let it be done. 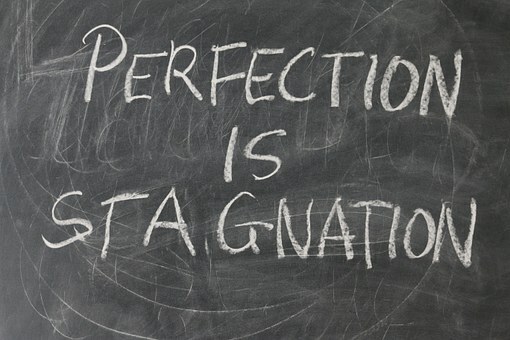 What have you been waiting on to start or finish that can be tied to perfectionism? I invite you to …just do it! Give it a try. Start it, then finish it. Put it out there in the world, whatever it is. When we release the idea of perfect and move into good enough, things will start to happen for us.